Tactile sensing and force feedback are - and have been - problem areas for robot grasping. Humans could see, select and pick so much faster. Yet to handle the millions of different everyday items in our factories and warehouses, costly positioning and camera systems have been required. Tactile sensing and force feedback are - and have been - problem areas for robot grasping. Humans could see, select and pick so much faster. Yet to handle the millions of different everyday items in our factories and warehouses, costly positioning and camera systems have been required. These systems made it easy for fast robots with simple grippers to pick items as they came along - but at great cost. Chicago's huge McCormick Place Conference Center was once again home to the Automate and ProMat trade shows. Automate for robotics; ProMat for material handling solutions. Over 900 exhibitors covered 350,000 sq ft at ProMat while 400+ companies exhibited at the Automate show. Up until recently no vendor has been able to randomly grasp - at speed - all the different products needing to be handled. A major objective of improved grasping - in addition to supplementing or replacing human labor - is to reduce the high cost of fixtures, conveyors, sorting and positioning systems. "Challenges include fundamental 1st principles of physics in the development of actuation and sensing. Other challenges include 2 point discrimination, contact localization, extrinsic and intrinsic actuation, back-drivability vs. compliance, speed/strength/power, hand/glove coverings that do not attenuate sensors/motion but are rugged when handling rough and sharp objects." RightHand Robotics was demonstrating their piece-picking solution - a vacuum stick supported by 3-fingers, and 3D vision software that can handle 1000s of SKUs, operate at high speed, has sensor feedback to learn by trial and error and also to ensure accurate order fulfillment. Many of RightHand's piece-picking gripper and software solutions were the end-of-arm-tool of choice on robot arms in other vendor booths. Emphasizing their software and systems, RightHand was promoting them to be integrated into warehouse workflows including goods-to-picker systems, picking to unit sorters, autobagger induction, and kitting. Kinema Systems demonstrated their Kinema Pick deep learning 3D vision system which speedily depalletizes multi-SKU, randomly arranged pallets of various sized boxes. Also demonstrated were grippers with lights or other forms of HRI because studies have shown that human-robot collaboration needs communication - even from colored lights - to facilitate adoption. Rethink Robotics has been a leader in this type of HRI. Their Sawyer robot uses screen eyes and tower and wrist colored lights to indicate movement, training and problems. Schunk's new elegant Co-act WSG gripper has finger lights that change color to indicate different modes of activity: red for training and problems; blue for safe operation; etc. using LEDs and a corresponding color coding system. EAOT is a moving target with multiple new vendors showing up frequently. The list below is of companies that actually produce and market grippers for industrial and collaborative robots now. Most did not have booths at the show. It is not, by any means, a complete list of gripper providers and doesn't include the growing list of Chinese providers. Nor does the list include vision, tool-changer or sensor providers, or grippers made by industrial robot manufacturers. Follow the highlighted links to get technical specifications. Active8 Robots Active8 Robots makes their own grippers but also resells multiple brands - from dual grippers to vacuum sticks to a 5-fingered hand. They also design and build custom EOAT. Barrett Technology The three-fingered BarrettHand has been widely used for many years. Its versatility is the main feature and the hand matches the functionality of a wide range of custom grippers by quickly switching part/tool shapes electronically. Chanto Air Hydraulics Chanto makes low-cost pneumatic parallel, angular, and air grippers for all types and sizes of robots including co-bots. QB Robotics QB is a 2011 spin-off from the University of Pisa and the Italian Institute of Technology. They make actuators, devices and systems for robotic hands, handles, delta robots and Variable Stiffness Actuators. They also have a 5-fingered soft robotic hand. On Robot ApS On Robot is a Danish startup attempting to fill the space provided by Robotiq, i.e., as principle supplier of grippers for Universal Robots line of UR robots. Their grippers are simple to use, plug compatible with UR robots and their dual gripper - two independent grippers on a single frame - is proving to be a novel time-saving device. RightHand Robotics Righthand Robotics makes and sells the ReFlex SF and ReFlex TakkTile 3-fingered hands for UR and Rethink Robotics co-bots. RHR is launching its new RightPick gripper which combines a vacuum stick with fingers to quickly pick and grasp individual items. “RightHand Robotics has created a transformative technology combining machine learning and smart hardware to address a tremendous opportunity in the logistics industry,” says investor Andy Rubin, Founder and CEO at Playground Global and formerly head of Google's robotics group. 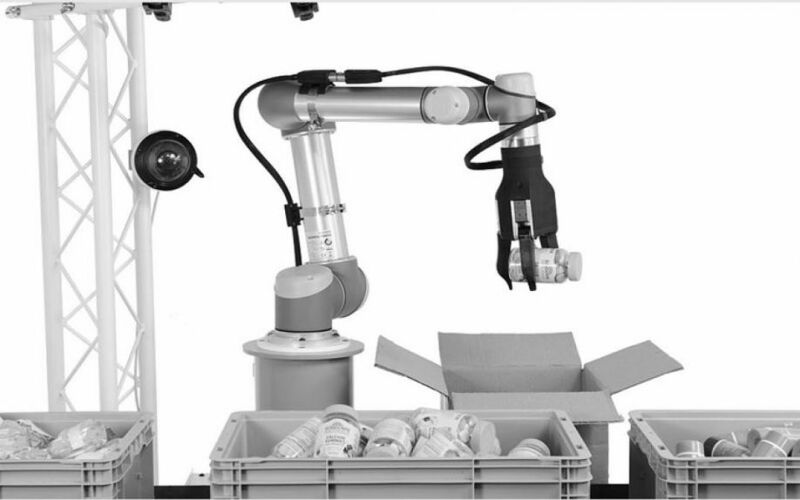 “For the first time, affordable industrial robots can grasp things they have never seen before." Robotiq Robotiq, a Canadian manufacturer with an international reach and a very large following, has been supplying grippers, cameras, vision systems and sensors for UR co-bot and industrial robot buyers since 2008. Their low-cost 2- and 3-finger grippers are standard starter sets for new co-bot customers. Sake Robotics This Japanese supplier of under-actuated parallel gripping devices uses long-lasting ceramic tendons as the link between the actuators and finger motion and supports all the major brands of co-bots plus industrial robot providers. The under-actuated fingers stay straight when picking up small objects and wrap around larger objects. Schunk With typical Schunk professionalism, they've renamed their line of grippers earmarked for co-bots as "co-act" grippers. The new HRC grippers, Co-act Gripper JL1, EGP, EGN and WSG were presented for the first time in live applications at the Automatica 2016 show and have been selling them ever since. Schmalz This large Germany-based provider of all things vacuum-related has been providing vacuum sticks and other pneumatic grasping devices for robots for many years, and for co-bots since they first hit the market. Shadow Hand Shadow Robot has been providing complex robotic hands and prosthetics since 1987. It has developed a wide range of products, some of which are appropriate to be the end-of-arm tool on co-bots. Shadow's Smart Grasping System with torque sensing has stored intelligence to know what it's grasping as it is approaching it, and chooses the correct grasp as a result of that foreknowledge. The system is compatible with all Shadow hands for all major brands of co-bots. Soft Robotics Soft Robotics is a Fanuc integrator and developer of soft-fingered sensitive grasping systems. Their adaptive, plug and play, air actuated soft elastomeric end effectors enable novel industrial applications on all types of robots and co-bots. Weiss Robotics Weiss Robotics' servo-electric GRIPKIT-E or smart pneumatic GRIPKIT are easily mounted on UR robot arms. Their URCAPS plug-in integrates into UR's Polyscope software system. Weiss also offers a wide range of gripping systems, and tactile and force torque sensing devices. Zimmer Group Zimmer is a German company with a wide range of products for the fields of handling technology, linear technology, and industrial and soft close damping technology. Most of their products and accessories have been adapted to work on UR and other co-bots.